In an unexpected turn of events, HMD’s Nokia device with the model number TA-1054 seems not to be the awaited bezel-less flagship Nokia 9 as we thought before, but rather the successor of Nokia 6, HMD’s first Android device. About the new Nokia 6 (TA-1054), rumors suggest a 4GB RAM and 32GB storage configuration. The device is expected to be unveiled next month in China, together with the Nokia 9. Nokia 9 and Nokia 6 (2018) will probably have their global premiere at MWC2018 in February next year. 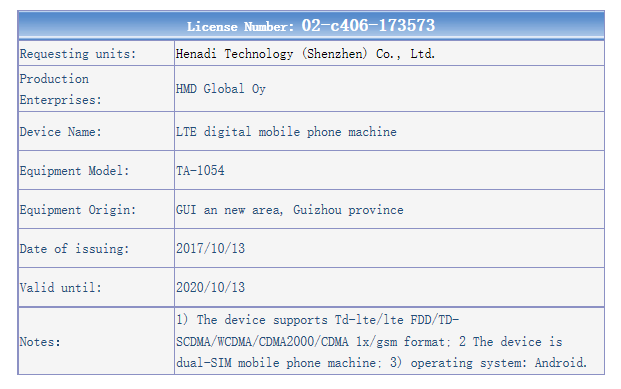 The mentioned new Nokia 6 with the model number TA-1054 passed TENAA’s certification process in China. At the moment, no pictures of the device are available in the database. Usually, it’s a matter of hours or days before pictures of a certified device appear in the database. When the pictures become available, we will update the article (or write a new one). This passing through the certification process suggest that HMD will soon launch new Nokia Android smartphones. We don’t know everything about them, but according to rumors – we should see a new Nokia 6 and the bezel-less flagship Nokia 9.